New details of foreign assets owned by Nigeria’s Chief of Army Staff, Tukur Buratai, have raised questions about whether their acquisition and disclosure were as transparent as the army had earlier claimed. The details, published Thursday, suggest that disclosures made to the Code of Conduct Bureau about the properties might have been misleading. The army had admitted a report that Mr. Buratai owned at least two multimillion naira properties in Dubai, the United Arab Emirate. The army however said that the assets were jointly owned by Mr. Buratai and his two wives – Aishatu and Kalsum —, and that they were bought with personal savings. 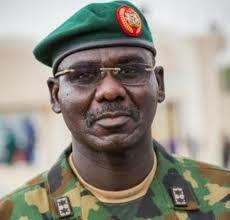 “It is a fact that the Buratai family have (sic) two properties in Dubai that were paid for installmentally through personal savings three years ago,” the army’s statement, signed by spokesperson Sani Usman, said. But a letter from the Code of Conduct Bureau published by The Nation Newspaper on Thursday said Mr. Buratai declared the Dubai properties under his wife’s name. Ms. Ofor, was, however, silent on which of Mr. Buratai’s wife the properties were listed as belonging to. Reached for comments on how his principal was able to afford Dubai properties with his salaries, Mr. Usman said Mr. Buratai could afford to buy properties “anywhere in the world” because of his extra farming businesses. Mr. Usman, a colonel, pushed back against claims that Mr. Buratai had suddenly become wealthy by courting public funds for himself, saying the claims emanated from those who hardly knew him. “Possibly you have never met him before, but at the rank of lieutenant-colonel, he was not staying in the barracks, he was staying in his personal house,” Mr. Usman said in a telephone interview in June. Mr. Usman declined to give specific details of the size and scope of Mr. Buratai’s farming business.